Evidence of increased cocaine availability is highlighted by the EU drugs agency (EMCDDA) today in its European Drug Report 2018: Trends and Developments released in Brussels (1). The development occurs in the context of a dynamic drug market which is able to adapt rapidly in response to drug control measures. 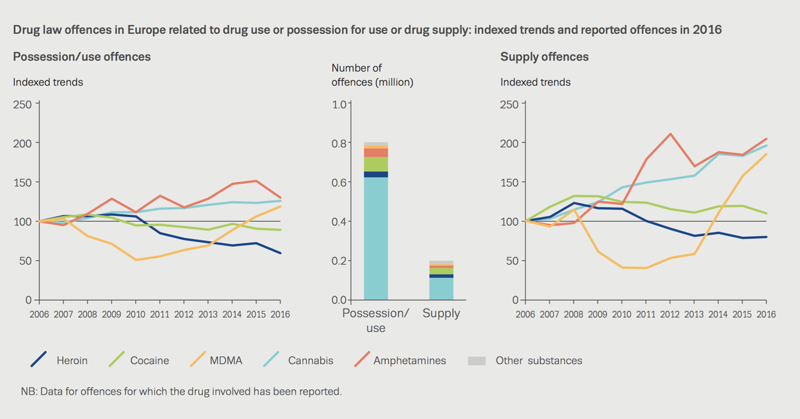 In its annual overview, the agency also explores challenges associated with new psychoactive substances (NPS), including: the availability of new synthetic opioids (particularly highly potent fentanyl derivatives); and problems associated with the use of synthetic cannabinoids in marginalised groups (including the prison population). The EMCDDA report notes that, across the board, drug availability is high and, in some areas, appears to be increasing. Latest figures show that in Europe (EU-28, Turkey and Norway) over 1 million seizures of illicit drugs were reported in 2016. Over 92 million adults in the EU (15–64 years) have tried an illicit drug in their lifetime and an estimated 1.3 million people received treatment for illicit drug use in 2016 (EU-28). Cocaine is the most commonly used illicit stimulant drug in Europe. 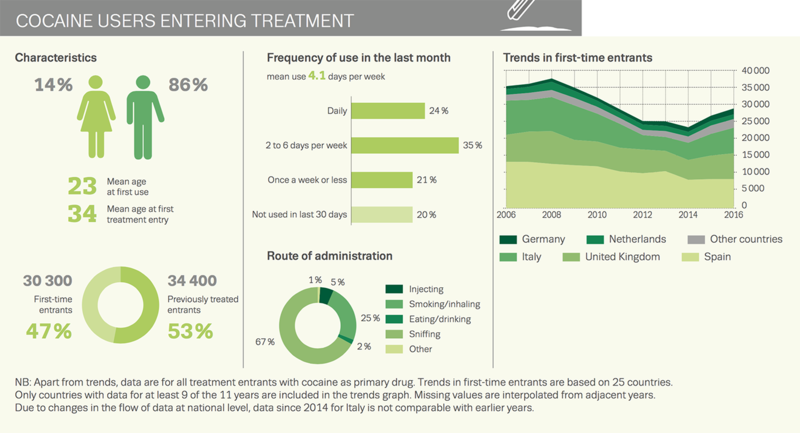 Around 2.3 million young adults (15–34 years) have used the drug in the last year (EU-28). Against a backdrop of signs of rising coca cultivation and cocaine production in Latin America, today’s analysis confirms that Europe’s cocaine market is buoyant, with indicators now pointing to increased availability of the drug in a number of countries. Although the price of cocaine remained stable, its purity at street level reached its highest level in a decade in 2016 (Infographic, p. 26). The number of cocaine seizures has also risen. Some 98 000 seizures of the drug were reported in the EU in 2016 (90 000 in 2015), amounting to 70.9 tonnes (Figure 1.6). At city level, a recent study of drug residues in municipal wastewater revealed that, between 2015 and 2017, there was an increase in cocaine residues in 26 of the 31 cities with data for that period (3). The highest traces were recorded in cities in Belgium, the Netherlands, Spain and the UK, with low levels reported in the eastern European cities studied (Figure 2.5). Today’s report reveals a rise in the number of first-time admissions to specialised treatment relating to cocaine (Infographic, p. 45). In 2016, 30 300 clients entered treatment for the first time for problems with this drug, over a fifth more than in 2014. In total, over 67 000 clients entered specialised treatment for cocaine-related problems in 2016. Of particular concern are the estimated 8 300 clients who entered treatment for primary crack cocaine use in 2016. 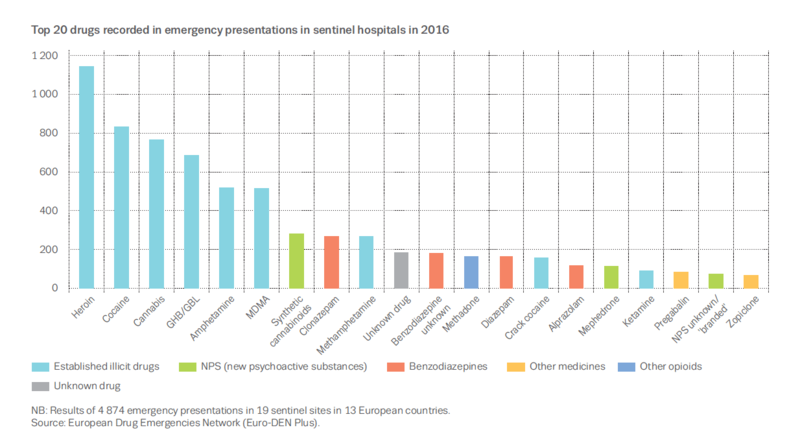 Furthermore, cocaine was the second most common drug to be reported in drug-related hospital emergency presentations in a network of 19 sentinel hospitals in 2016 (Euro-DEN Plus)(Figure 3.7). Trafficking methods and routes also appear to be changing. The Iberian Peninsula — historically the main entry point for maritime shipments of cocaine into Europe — though still important, appears less prominent in the 2016 data, with large seizures now reported in container ports further north. In 2016, Belgium seized 30 tonnes of cocaine (43% of the annual estimated total amount of cocaine seized in the EU). EMCDDA Director Alexis Goosdeel says: ‘The findings from our new report indicate that Europe is now experiencing the consequences of increased cocaine production in Latin America. Early warnings from wastewater analysis about rising cocaine availability are now supported by other data suggesting growing supply, including increases in purity and in the number and quantity of cocaine seizures. We must be concerned about the health implications of cocaine use as we are beginning to see some worrying developments in this area, including a larger number of people entering treatment for the first time for cocaine problems. These changes underline the growing importance of providing effective prevention, treatment and harm-reduction interventions for cocaine users’. Europe is an important market for illicit drugs, which are trafficked in from a number of world regions, including Latin America, West Asia and North Africa. However, today’s report also highlights the role of Europe as a producing region, noting that: ‘This year, for a wide range of substances, we are seeing some worrying signs of increased levels of drug production now taking place within Europe’. Production takes place closer to consumer markets for a number of reasons, including: convenience; reducing the risk of detection at borders; and, depending on the drug, the availability or cost of essential chemicals needed in the production process. The report notes several examples of increased drug production inside Europe and innovation in production methods. 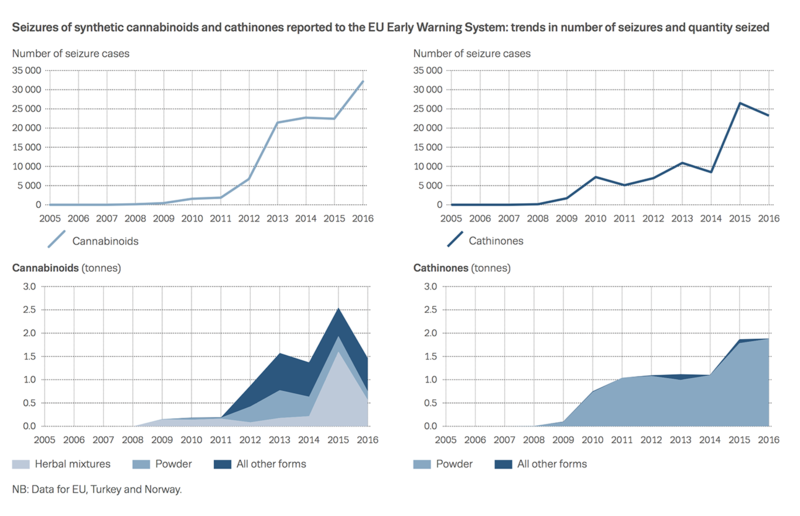 These include evidence of: illicit laboratories processing cocaine; an increase in the number of MDMA (‘ecstasy’) laboratories dismantled; the scaling up of, and greater organised crime involvement in, methamphetamine production; the final phases of amphetamine production taking place in the country of consumption; and, a small number of heroin production laboratories detected. Some of the synthetic drugs produced in the EU are destined for external markets such as the Americas, Australia, the Middle and Far East and Turkey. Increased production of high potency cannabis within Europe appears to have impacted on the activities of cannabis producers located outside of the EU, as seen by the higher potency of cannabis resin trafficked into Europe from Morocco. There are also signs that NPS, commonly produced in China and shipped to Europe for packaging, are sometimes manufactured within European borders. Cannabis remains the most widely used illicit drug in Europe, its prominence evident in data on prevalence, drug law offences, seizures and new treatment demands. Some 17.2 million young Europeans (15–34 years) have used cannabis in the last year (EU-28) and around 1% of European adults (15–64 years) are daily or almost daily users (EU-28). Cannabis was involved in over three-quarters (77%) of the 800 000 drug use or possession offences reported in the EU in 2016 for which the primary drug is known (Figure 1.14). It is also the most seized drug, with 763 000 seizures of cannabis products reported in the EU in 2016. Cannabis is responsible for the greatest share (45%) of new entrants to drug treatment in Europe (EU-28, Turkey and Norway). 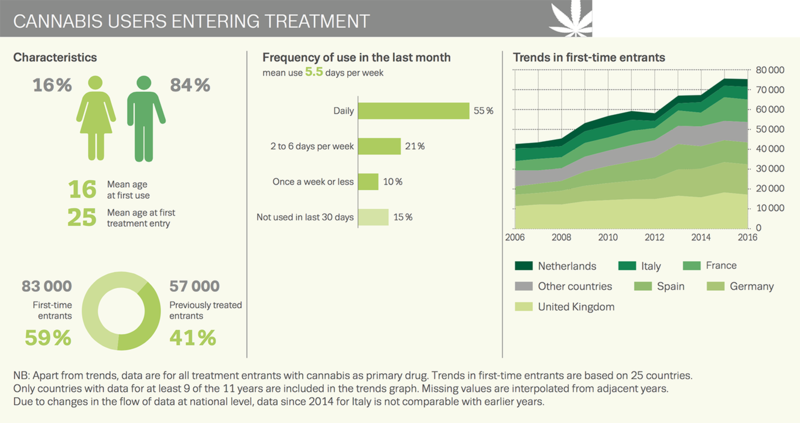 The number of first-time entrants for cannabis problems rose from 43 000 in 2006 to 75 000 in 2016 in the 25 countries with data for both years (Infographic, p.41). Recent changes in the regulatory framework for cannabis in parts of the Americas — including legalisation in some jurisdictions — have led to the rapid emergence in these locations of a commercial, recreational cannabis market. This is resulting in innovation in delivery systems and in cannabis product development (e.g. e-liquids, edible products and high potency strains). It is unclear what the implications for Europe will be if a large legal market for this drug develops in parts of the Americas, but an impact on patterns of supply or use in Europe cannot be ruled out. The EMCDDA is monitoring international developments in cannabis regulation closely to facilitate a more informed understanding of the changes taking place and help identify any impact they may have on the European situation (4). Among the policy issues receiving greater attention in the context of changing international perspectives on cannabis regulation is that of cannabis use and impaired driving. This is the focus of a recent EMCDDA report drawing on insights from international experts (5). New psychoactive substances (NPS/’new drugs’) remain a considerable policy and public health challenge in Europe. Not covered by international drug controls, NPS comprise a range of substances, including synthetic cannabinoids, opioids, cathinones and benzodiazepines (Figure 1.10). In 2017, 51 NPS were reported for the first time to the EU Early Warning System (EWS) — a rate of around one per week. Although the annual total number of new substances making their debut on the market is down on the peak years — 98 in 2015, 101 in 2014 — the overall number of NPS available remains high. By the end of 2017, the EMCDDA was monitoring over 670 NPS (compared with around 350 in 2013)(6). Health harms linked to new synthetic cannabinoids and new synthetic opioids — including acute intoxications and deaths — prompted the EMCDDA to conduct an unprecedented nine risk assessments in 2017. New synthetic cannabinoids, 179 of which have been detected since 2008 (10 in 2017), represent the largest chemical group monitored by the EMCDDA. Often sold as ‘herbal smoking mixtures’, they were the most frequently seized NPS in 2016, with just over 32 000 seizures reported (compared with 10 000 seizures in 2015)(Figure 1.12). This accounted for nearly half of the total number of seizures of NPS reported to the agency in 2016. Four synthetic cannabinoids were risk assessed in 2017 (AB-CHMINACA, ADB-CHMINACA, 5F-MDMB-PINACA and CUMYL-4CN-BINACA). Highly potent new synthetic opioids (particularly fentanyl derivatives), which mimic the effects of naturally derived opiates (e.g. heroin and morphine) are increasingly detected. These are sometimes available in novel forms (e.g. nasal sprays) or are sold as, or mixed with, illicit drugs, such as heroin or cocaine. 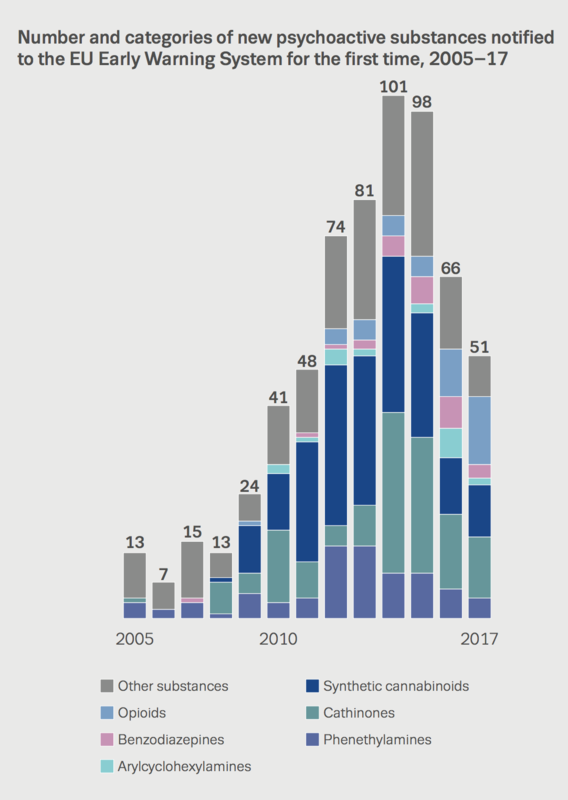 A total of 38 new synthetic opioids have been detected on Europe’s drug market since 2009 (13 in 2017). Fentanyl derivatives, key players in the current US opioid crisis, merit continued concern and vigilance in Europe. These substances — some many times more potent than morphine — accounted for over 70% of the estimated 1 600 seizures of new synthetic opioids reported in 2016. Ten new fentanyl derivatives were reported through the EWS in 2017, five of which were risk assessed (acryloylfentanyl, furanylfentanyl, 4-fluoroisobutyrylfentanyl, tetrahydrofuranylfentanyl and carfentanil). Prisons are a critical setting for addressing the healthcare needs of drug users and doing so can bring benefits to the wider community (e.g. preventing overdose after release; reducing the transmission of drug-related infectious diseases, such as HIV and HCV). This year’s report highlights the opportunities for intervening in this setting and draws attention to the national variability in the provision of services (7). In a new multi-country study published alongside today’s report (8), the agency investigates the growing health and security issues raised by the use of NPS in prison. ‘NPS use and related harms are now an important new challenge for the prison system in Europe’, states the study. Of the four main types of NPS found in prisons, synthetic cannabinoids are the most reported. Important drivers for their use in prisons include the ease with which they can be smuggled (e.g. liquefied and sprayed onto paper or textiles) and the difficulty in detecting them in drug tests. While overall, in terms of volume, traditional offline drug markets still predominate, online markets appear to be of growing importance, posing a new challenge for drug control measures. A recent EMCDDA–Europol study identified over 100 global darknet markets, on which around two-thirds of purchases were drug-related (9). The surface web and social media also appear to be growing in importance, especially regarding the supply of NPS and access to misused medicines. Today’s report raises concern over the emergence, on the street and online, of new benzodiazepines, not authorised as medicines in the EU. The EMCDDA is currently monitoring 23 new benzodiazepines (3 detected for the first time in Europe in 2017). Some are sold under their own names (e.g. diclazepam, etizolam, flubromazolam, flunitrazolam, fonazepam). In other cases, producers use these substances to manufacture fake versions of commonly prescribed benzodiazepine medicines (e.g. diazepam, alprazolam), which are then sold on the illicit market. In 2016, over half a million tablets containing new benzodiazepines, or similar substances, were seized, some two-thirds up on the number seized in 2015. In an analysis published alongside today’s report, the EMCDDA explores the misuse of benzodiazepines among high-risk opioid users in Europe (10). While much prescribing of these medicines to high-risk drug users is done with legitimate therapeutic aims in mind, they may be diverted and misused, contributing to increased morbidity and mortality in this group. Around 40% of those entering treatment for primary opioid use, reported benzodiazepines as their secondary problem drug. The study includes a timeline of the reporting of new benzodiazepines to the EMCDDA. Today’s report highlights concern over the high number of drug overdose deaths in Europe, which has been rising over the last four years. 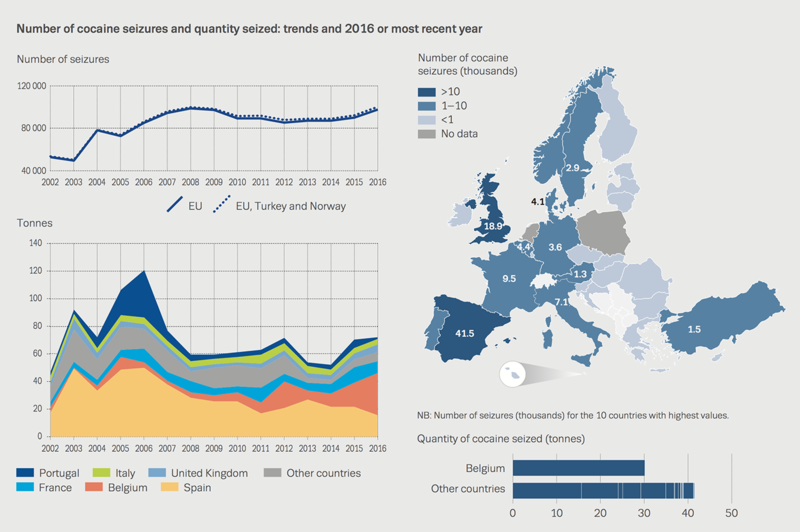 Over 9 000 overdose deaths, mainly related to heroin and other opioids — although often combined with other substances, particularly alcohol and benzodiazepines — are estimated to have occurred in Europe in 2016 (EU-28, Turkey and Norway). The challenges posed by old and new opioids place a renewed focus on the role of the opioid antidote naloxone in overdose response strategies (11). The report underlines the urgent need to ‘review current naloxone policies and increase training and awareness-raising for both drug users and professionals who may encounter these drugs’. (1) The European Drug Report 2018 package is available at www.emcdda.europa.eu/edr2018. Data presented in the report relate to 2016 or the last year available. Figures and graphics cited in this news release appear in the report itself. Additional figures and tables may be found in the 2018 Statistical Bulletin. 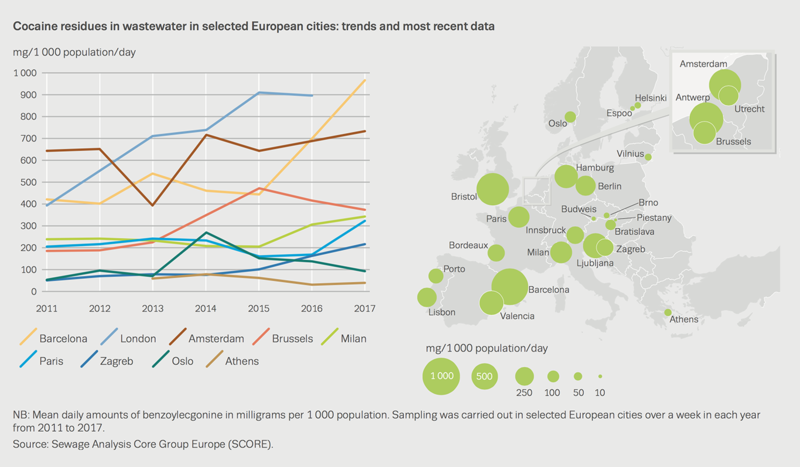 (3) www.emcdda.europa.eu/news/2018/1/latest-data-wastewater-european-cities_en Wastewater analysis reports on collective consumption of pure substances within a community and the results are not directly comparable with prevalence estimates from national population surveys.